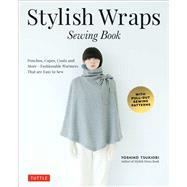 This DIY sewing book presents a fabulous new collection of lightweight wraps that are easy to sew and look fantastic! Stylish Wraps Sewing Book provides five free full-sized patterns that can be used to create 22 timeless wraps to keep the chill off—and look great in the process. All the sewing designs can be made in a few hours for a fraction of what you would pay in a store. And it is easy to mix and match different fabrics and styles to suit your wardrobe and mood. The versatility of the sewing patterns makes it easy to adapt any of the designs to suit your unique style. The patterns are easily adjusted for size, and the soft, loose lines work for any figure. Whether your tastes run to ultra-feminine or ultra-classic, this exceptional home-sewing book has something for you! Yoshiko Tsukiori is an icon of DIY fashion, garnering fans in France, Australia, the UK and the North America, as well as in her native Japan. Her designs span from clothes for babies and children to women's daily wear to wedding dresses. She is the author of the universally popular Stylish Dress Book series and many other titles.